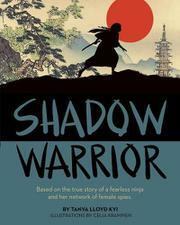 A lengthy picture book about a female ninja in 16th-century Japan. Mochizuki Chiyome lives in the Koga region of feudal Japan, where constant warfare between warlords called daimyos creates the need for both samurais and ninjas. Chiyome’s great-grandfather was a famous ninja, and she is training to be one too. Her arduous preparation includes dangling from a cliff as well as more subtle skills, such as hensojutsu, the art of disguise. After years of training, she becomes a ninja only to be married off to Mochizuki Moritoki, the nephew of a powerful daimyo. When her husband is killed in battle, Chiyome—whose choices as a widow are either taking care of other women’s children or retreating to a spiritual life—convinces her uncle-in-law to take advantage of her ninja skills. She recruits and trains a network of female ninjas to spy for him. Kyi’s bracing text (based on some real historical figures, as revealed in an epilogue) gives a vivid sense of detail and danger, although it’s too bad the illustrated map of 16th-century feudal Japan does not clearly mark the locations referenced in the story. The book’s design is otherwise stellar. Japanese landscape paintings bordered with stylized patterns combine smoothly with Krampien’s bold, emotive illustrations, heightening the overall ambience and tone of the story.